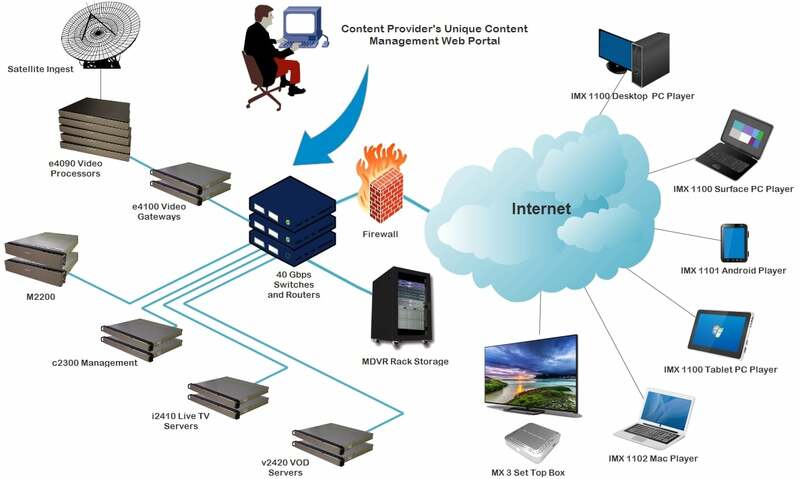 IMX VOD Edge Node Server - MatrixStream Technologies, Inc.
MatrixStream VOD edge node servers are important part of the MatrixCloud IPTV ecosystem. Designed to server highest demand IPTV video on demand requirements, the v2420 and X1v are work horses that are scalable to handle million of users. Working together with other MatrixStream servers, the MatrixCloud IPTV system stream HD quality content to multiple devices securely and easily. The 1U v2420 VOD edge node server can stream up to 1,000 concurrent streams or support up to 10,000 viewers based on 10:1 viewing ratio. The 2U X1v VOD edge node server can stream up to 10,000 concurrent streams or support up to 100,000 viewers based on 10:1 viewing ratio. Unlimited Scalablity – A single headend can support unlimited number of i2410 live tv servers so you can scale to million of users. i2410 live tv server uses embedded OS for carrier class high availablitly. Failover is build into the system. HEVC (High Efficiency Video Coding) / H.265 Support – MatrixStream streaming servers are future-proof with full support for H.264/HEVC* video compression. This will enable service providers to offer extremely high-quality videos over “best effort” broadband networks at very low-bitrate. STAS – Smart Targeted AD System – STAS(TM) allows anti-skip targeted video ad insertion that is in pre-roll or mid-roll. The ad can include alpha blended graphic overlays for advance custom ad branding. STAS(TM) can target ads based on each individual user’s profile and demographic even when many users are watching the same video. APS – Anti-Piracy Security – APS Fully protects against video piracy by using condition access (CA) and MatrixCrypt(TM) DRM technologies with 128bit AES Encryption and SSL. True Streaming vs. Progressive Download – MatrixCast Streaming protocol is designed to stream to TV instantly with lowest latency for live tv in the industry. The MatrixCast streaming server is a true streaming server vs. the progessive download what users are used to see on the Internet. 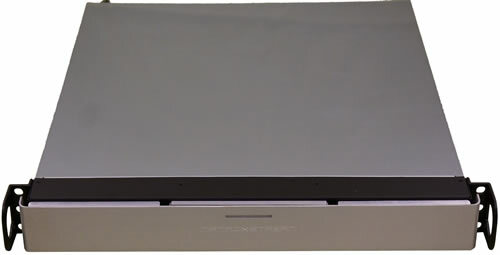 In addition, most progressive download on the Internet today are designed to send low-quality videos to a small PC window vs. MatrixCast to a full TV screen. Fast Forward/Rewind Streaming Video with 64X – Users can smoothly fast forward and rewind a MatrixCast Streaming video at multiple speeds (up to 64X speeds). This is not possible with traditional progressive download method on the PC today. Instant Video Loading and fast channel changing over the Internet – Unlike traditional streaming methods where videos over IP could take a up to 30 seconds or longer to load and play, MatrixCast Streaming is designed to start video playing within 1-2 secs or less after a viewer selects a video. This important feature is designed to simulate the TV experience viewers are familiar today over IP. Skip Protection = MatrixCast Streaming protocol is designed to work over unstable IP network such as the Internet, where IP traffic congestions and bursts could happen at any time. MatrixCast Streaming protocol has bulit-in skip protection support to ensure high quality video viewing. Full Screen Streaming Over the Internet – MatrixCast Streaming is designed to stream to a full TV screen over the Internet while traditional streaming will not work over the Internet nor can it do full screen streaming. Firewall and NAT friendly – Unlike RTSP streaming, MatrixCast patent pending streaming protocol works over firewall and NAT servers. This allows IPTV operators to take full advantage of IP video without compromises on security. High Definition Video Support – MatrixCast Streaming can stream High Definition (HD) videos in as little as 2.0 Mbps and Standard Definition (SD) videos in as little as 750 Kbps. Custom Branding – MatrixCast Streaming allows IPTV to custom brand their IPTV channels with their own logos. This alone could save thousands in logo encoding costs. Streaming Authentication and Encryption – MatrixCast Streaming comes with full streaming authentication and encryption support. This allows IPTV operators to ensure only viewers with the proper rights can see the videos. Conditional access is built-in. No video or chunks of video are stored on the hard drive for maximum security. High Definition Audio Support – MatrixCast Streaming is the most advanced no compromise streaming technology available today supporting digitial 5.1 and 7.1 surround sound. This ensures viewers can experience the same sound they are used to with their DVD and BlueRay on IP videos. Billing API – MatrixCast Streaming works with MatrixStream IMX billing API. This allows IPTV operators the flexibility of billing customers based on monthly subscription fee or Pay-Per-View. PC and IP STB Clients – MatrixCast Streaming is fully supported on MatrixStream’s MX 1100 PC viewing client and the IMX IP set top box viewing client. Viewers have total flexibility in how to see their videos. Scalable Via N+1 – IMX 2400 MatrixCast Streaming servers are fully scalable vis N+1 clustering support. IPTV operators can simply add more servers when additioanl streams are required. Also each matrixstream live tv encoder can support N+1 number of MatrixCast live tv servers so you can support millions of users giving unlimited scalability. Fully Integrated with IMX IPTV Solution – IMX 2400 MatrixCast Streaming servers are fully integrated with rest of the IMX IPTV solution. IMX 2400 can be managed by IMX 500 enterprise middleware server or IMX M2200 service provider middleware server. High Availablity – MatrixStream streaming servers are embedded solid state servers to achieve carrier class five-nine availability.